Wrap around semi-rigid soft lateral system to fit the smaller client comfortably with a minimum of bulky hardware.  Modular construction allows frame upgrades as the client grows. Ultra low seat height for true EI use and gait training. 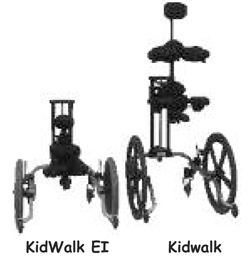 KidWalk EI supplies true natural gait patterns for the client. Minimized seat size to accomodate and support the EI client. *If no selection is marked the standard configurations will be supplied. Note: Depth is variable by the wrap of the semi rigid lateral support system, see the pictures below for reference. 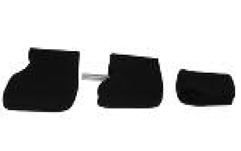 Note: Use of the Dynamic Leg Wraps require that the seat height is set at 12 inches or above on the KidWalk EI. Note: All seat options are available only on a Standard KidWalk seat, the standard KidWalk EI seat cannot be modified. Low seat height for clients with minimal leg length starting at 8" and less. Smaller seat configuration to more comfortably fit the smaller client. Lateral supports are able to mount low for the client with a shorter trunk. Exclusive semi rigid Soft Lateral System for maximum support with minimum hardware. All support systems configured to fit to the younger/smaller client population. 16" Wheels keep hands away from the wheels. KidWalk EI support systems are designed to fit the Early Intervention population. Many of the larger KidWalk support systems will interchange to support client growth. Modular construction for the ability o change as the client's needs change.